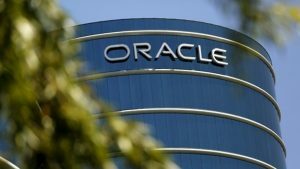 The push by Oracle Corp into the cloud computing arena has picked up momentum helping to spark a fourth consecutive quarter of increased revenue for the maker of software. The company, which established a record high at the close Wednesday for its stock, posted total sales easily topping estimates by analysts. The cloud businesses at Oracle grew by 58% during its fiscal fourth quarter. At the same time, new licenses for software, a measure tied to the traditional software on-premise offering, dropped by 5% in comparison with a 16% drop the prior period. The long shift by Oracle into the cloud, which allows clients access to services without needing to install them onto their own systems, is now producing an increase in growth, indicating the company will be able to compete against its biggest rivals like Microsoft Corp and Salesforce.com. It has benefited with applications that help customers in areas like management of customer relationships, human resources and finance. Sales in that part of the business, which was for the first time it appeared in an earnings report, jumped by close to 70%. Everything appears very strong said an analyst on Wall Street adding that Oracle has become a legitimate as well as formidable player in the cloud arena. Oracle shares were up 12% during afterhours trading following the release of its financials. Investors in 2017 remained optimistic with the stock in the company increasing by 20% and closing Wednesday at a record hit of $46.33. There is rapid adoption of our Cloud said Safra Catz the CEO at Oracle in a prepared statement. This hyper-growth in the cloud is expanding the company’s operating margins and we expect growth in per share earnings to accelerate during fiscal 2018. Oracle’s adjusted revenue was up 3% ending the quarter at $10.9 billion as of May 31, said the company in a prepared statement on Monday. On average, Wall Street was expecting adjust revenue to be $10.5 billion. Profit, excluding certain costs, was 89% per share, which topped estimates that averaged 78 cents. Oracle’s net income was up 15% to end the quarter at $3.2 billion. During a conference call with analysts, the CEO said she believes adjusted revenue will increase 4% to 6% based on constant currency in the ongoing quarter. She also added that adjusted earnings are projected to be between 59 cents and 61 cents a share. She said Oracle should have earnings per share growth in the double digits for its fiscal year.